The FBS/FCS Top 50 teams after Week 4 of the Football Bowls Subdivision college season. Ranking is based on this week’s polls (Associated Press media / USA Today-American Football Coaches Association / National Football Foundation-Football Writers Association of America) and independent criteria. North Dakota State, which is receiving votes in both the AP and NFF-FWAA polls, is a member of the Missouri Valley Football Conference and will play in the Football Championship Subdivision playoffs. 1. Alabama (4-0, 1-0 SEC West) (1/1/1) vs. Kentucky (2-2, 1-1 SEC East) Saturday, Oct. 1, 7 p.m. (ESPN). Last week: Beat Kent State, 48-0. Upcoming: Saturday, Oct. 8 at No. 21 Arkansas (3-1, 0-1 SEC West), TBA. 2. Ohio State (3-0, 0-0 Big Ten East) (2/2/2) vs. Rutgers (2-2, 0-1 Big Ten East) Saturday, 12 p.m. (Big Ten Network). Last week: Idle. Upcoming: Saturday, Oct. 8 vs. Indiana (2-1, 0-0 Big Ten East), 3:30 p.m., TBA. 3. Louisville (4-0, 2-0 ACC Atlantic) (3/4/3) at No. 4t Clemson (4-0, 1-0 ACC Atlantic) Saturday, 8 p.m. (ABC). Last week: Beat Marshall, 59-28. Upcoming: Friday, Oct. 14 vs. Duke (2-2, 0-1 ACC Coastal), 7 p.m. (ESPN). 4t. Michigan (4-0, 1-0 Big Ten East) (4/5/4) vs. No. 8 Wisconsin (4-0, 1-0 Big Ten West) Saturday, 3:30 p.m. (ABC). Last week: Beat Penn State, 49-10. Upcoming: Saturday, Oct. 8 at Rutgers (2-2, 0-1 Big Ten East), 8 p.m., TBA. 4t. Clemson (4-0, 1-0 ACC Atlantic) (5/3/5) vs. No. 3 Louisville (4-0, 2-0 ACC Atlantic) Saturday, 8 p.m. (ABC). Last week: Beat Georgia Tech, 26-7. Upcoming: Friday, Oct. 7 at Boston College (2-2, 0-2 ACC Atlantic), 7:30 p.m. (ESPN). 6. Houston (4-0, 1-0 American West) (6/7/6) vs. Connecticut (American East) Thursday, 8 p.m. (ESPN). Last week: Beat Texas State, 64-3. Upcoming: Saturday, Oct. 8 at No. 43 Navy (3-0, 2-0 American West), 3 p.m. (CBS Sports Network). 7. Stanford (3-0, 2-0 Pac-12 North) (7/6/7) at No. 9 Washington (4-0, 1-0 Pac-12 North) Friday, 9 p.m. (ESPN). Last week: Beat UCLA, 22-13. Upcoming: Saturday, Oct. 8 vs. Washington State (1-2, 0-0 Pac-12 North), 10:30 p.m., TBA. 8. Wisconsin (4-0, 1-0 Big Ten West) (8/8/8) at No. 4t Michigan (4-0, 1-0 Big Ten East) Saturday, 3:30 p.m. (ABC). Last week: Beat Michigan State, 30-6. Upcoming: Saturday, Oct. 15 vs. No. 2 Ohio State (3-0, 0-0 Big Ten East), 8 p.m. (ABC/ESPN/ESPN2). 9. Texas A&M (4-0, 2-0 SEC West) (9/10/9) at South Carolina (2-2, 1-2 SEC East) Saturday, Oct. 1, 4 p.m. (SEC Network). Last week: Beat Arkansas, 45-24. Upcoming: Saturday, Oct. 8 vs. No. 11 Tennessee (4-0, 1-0 SEC East), TBA. 10. Washington (4-0, 1-0 Pac-12 North) (10/9/10) vs. No. 7 Stanford (3-0, 2-0 Pac-12 North) Friday, 9 p.m. (ESPN). Last week: Beat Arizona, 35-28. Upcoming: Saturday, Oct. 8 at No. 46 Oregon (2-2, 0-1 Pac-12 North), 7:30 p.m. (FOX). 11. Tennessee (4-0, 1-0 SEC East) (11/11/11) at No. 19 Georgia (3-1, 1-1 SEC East) Saturday, 3:30 p.m. (CBS). Last week: Beat Florida, 38-28. Upcoming: Saturday, Oct. 8 at No. 9 Texas A&M (4-0, 2-0 SEC West), TBA. 12. Florida State (3-1, 0-1 ACC Atlantic) (12/12/12) vs. No. 34 North Carolina (3-1, 1-0 ACC Coastal) Saturday, 3:30 p.m. (ESPN). Last week: Beat South Florida, 55-35. Upcoming: Saturday, Oct. 8 at No. 14 Miami, Fla. (3-0, 0-0 ACC Coastal), TBA. 13. Baylor (4-0, 1-0 Big 12) (13/13/14) at Iowa State (1-3, 0-1 Big 12) Saturday, 12 p.m. (FOX Sports 1). Last week: Beat Oklahoma State, 35-24. Upcoming: Saturday, Oct. 15 vs. Kansas (1-2, 0-0 Big 12), TBA. 14. Miami, Fla. (3-0, 0-0 ACC Coastal) (14/14/13) at Georgia Tech (ACC Coastal) Saturday, 12 p.m. (ESPN2). Last week: Idle. Upcoming: Saturday, Oct. 8 vs. No. 12 Florida State (3-1, 0-1 ACC Atlantic), TBA. 15. Nebraska (4-0, 1-0 Big Ten West) (15/15/15) vs. Illinois (Big Ten West) Saturday, 3:30 p.m. (ESPN2). Last week: Beat Northwestern, 24-13. Upcoming: Saturday, Oct. 15 at Indiana (2-1, 0-0 Big Ten East), 3:30 p.m., TBA. 16. Mississippi (2-2, 1-1 SEC West) (16/17/16) vs. No. 39 Memphis (3-0, 0-0 American West) Saturday, Oct. 1, 7 p.m. (ESPN2/SEC Network). Last week: Beat Georgia, 45-14. Upcoming: Saturday, Oct. 15 at No. 21 Arkansas (3-1, 0-1 SEC West), TBA. 17. Michigan State (2-1, 0-1 Big Ten East) (17/16/18) at Indiana (Big Ten East) Saturday, 8 p.m. (Big Ten Network). Last week: Lost to Wisconsin, 30-6. Upcoming: Saturday, Oct. 8 vs. Brigham Young (1-3 Independent), 3:30 p.m., TBA. 18. Utah (4-0, 1-0 Pac-12 South) (18/18/17) at California (2-2, 0-1 Pac-12 North) Saturday, 6 p.m. (Pac-12 Network). Last week: Beat Southern California, 31-27. Upcoming: Saturday, Oct. 8 vs. Arizona (2-2, 0-1 Pac-12 South), 11 p.m., TBA. 19. Georgia (3-1, 1-1 SEC East) (25/20/20) vs. No. 11 Tennessee (4-0, 1-0 SEC East) Saturday, 3:30 p.m. (CBS). Last week: Lost to Mississippi, 45-14. Upcoming: Saturday, Oct. 8 at South Carolina (2-2, 1-2 SEC East), 7:30 p.m. (SEC Network). 21. Arkansas (3-1, 0-1 SEC West) (20/22/25t) vs. Alcorn State (1-2, 1-2 FCS SWAC) Saturday at Llittle Rock, Ark. (War Memorial Stadium), 12 p.m. (SEC Network). Last week: Lost to Texas A&M, 45-24. Upcoming: Saturday, Oct. 8 vs. No. 1 Alabama (4-0, 1-0 SEC West), TBA. 22. Texas (2-1, 0-0 Big 12) (22/25/21t) at Oklahoma State (Big 12) Saturday, 12 p.m. (ABC). Last week: Idle. Upcoming: Saturday, Oct. 8 vs. No. 27 Oklahoma (1-2, 0-0 Big 12) at Dallas, Texas (Cotton Bowl Stadium), 12 p.m. (FOX Sports 1). 23. Texas Christian (3-1, 1-0 Big 12) (21/19/31t) vs. No. 27 Oklahoma (1-2, 0-0 Big 12) Saturday, 5 p.m. (FOX). Last week: Beat Southern Methodist, 33-3. Upcoming: Saturday, Oct. 8 at Kansas (1-2, 0-0 Big 12), 12 p.m. (ESPNU). 24. Boise State (3-0, 0-0 MW Mountain) (24/27/21t) vs. Utah State (2-2, 0-1 MW Mountain) Saturday, 10:15 p.m. (ESPN2). Last week: Beat Oregon State, 38-24. Upcoming: Friday, Oct. 7 at New Mexico (1-2, 0-0 MW Mountain), 9 p.m. (CBS Sports Network). 25. Arizona State (4-0, 1-0 Pac-12 South) (26/28/19) at Southern California (1-3, 0-2 Pac-12 South) Saturday, 8:30 p.m. (FOX). Last week: Beat California, 51-41. Upcoming: Saturday, Oct. 8 vs. No. 33 UCLA (2-2, 0-1 Pac-12 South), 10:30 p.m., TBA. 26. Florida (3-1, 1-1 SEC East) (23/21/35) at Vanderbilt (2-2, 0-1 SEC West) Saturday, 12 p.m. (SEC Network). Last week: Lost at Tennessee, 38-28. Upcoming: Saturday, Oct. 8 vs. No. 31 Louisiana State (2-2, 1-1 SEC West), 12 p.m. (ESPN). 27. Oklahoma (1-2, 0-0 Big 12) (27/29/25t) at No. 23 Texas Christian (3-1, 1-0 Big 12) Saturday, 5 p.m. (FOX). Last week: Idle. Upcoming: Saturday, Oct. 8 vs. No. 22 Texas (2-1, 0-0 Big 12) at Dallas, Texas (Cotton Bowl Stadium), 12 p.m. (FOX Sports 1). 28. West Virginia (3-0, 0-0 Big 12) (29/30/25t) vs. No. 44 Kansas State (2-1, 0-0 Big 12) Saturday, 3:30 p.m. (ESPNU). Last week: Beat Brigham Young, 35-32. Upcoming: Saturday, Oct. 15 at Texas Tech (2-1, 0-0 Big 12), TBA. 29. Iowa (3-1, 1-0 Big Ten West) (33/26/31t) vs. Northwestern (1-3, 0-1 Big Ten West) Saturday, 12 p.m. (ESPNU). Last week: Beat Rutgers, 14-7. Upcoming: Saturday, Oct. 8 at No. 38 Minnesota (3-0, 0-0 Big Ten West), 12 p.m. (ABC/ESPN2). 30. Auburn (2-2, 1-1 SEC West) (35/36/23t) vs. Lafayette Monroe (1-2, 0-1 Sun Belt) Saturday, 3:30 p.m. (SEC Network). 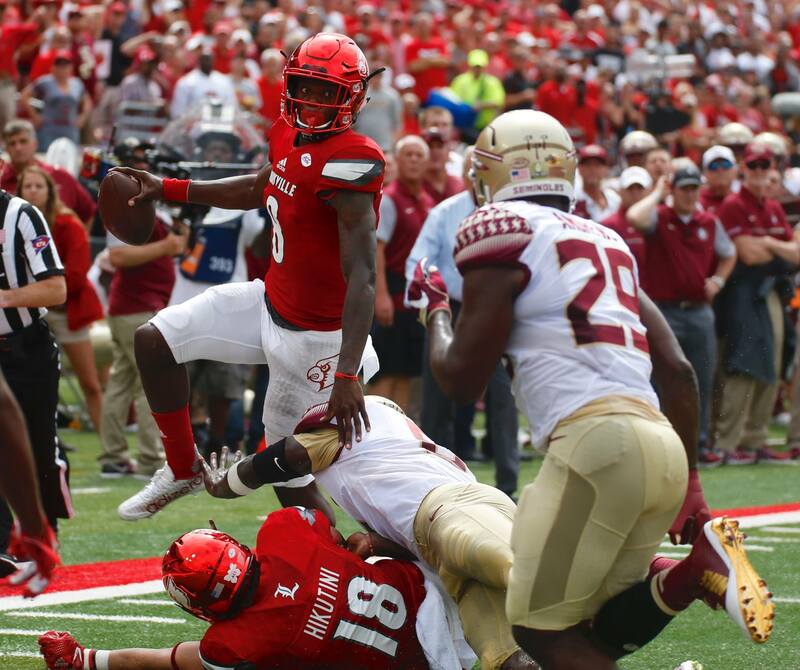 Last week: Beat Louisiana State, 18-13. Upcoming: Saturday, Oct. 8 at Mississippi State (2-2, 1-1 SEC West), 12 p.m. (SEC Network). 31. Louisiana State (2-2, 1-1 SEC West) (36/31/28t) vs. Missouri (2-2, 0-1 SEC West) Saturday, 7:30 p.m. (SEC Network). Last week: Lost to Auburn, 18-13. Upcoming: Saturday, Oct. 8 at No. 26 Florida (3-1, 1-1 SEC East), 12 p.m. (ESPN). 32. Colorado (3-1, 1-0 Pac-12 South) (31/37/28t) vs. Oregon State (1-2, 0-0 Pac-12 North) Saturday, 2:30 p.m. (Pac-12 Network). Last week: Beat Oregon, 41-38. Upcoming: Saturday, Oct. 8 at Southern California (1-3, 0-2 Pac-12 South), TBA. 33. UCLA (2-2, 0-1 Pac-12 South) (34/34t/28t) vs. Arizona (2-2, 0-1 Pac-12 South) Saturday, 10:30 p.m. (ESPN). Last week: Lost to Stanford, 22-13. Upcoming: Saturday, Oct. 8 at No. 25 Arizona State (4-0, 1-0 Pac-12 South), 10:30 p.m., TBA. 34. North Carolina (3-1, 1-0 ACC Coastal) (32/23/nr) at No. 12 Florida State (3-1, 0-1 ACC Atlantic) Saturday, 3:30 p.m. (ESPN). Last week: Beat Pittsburgh, 37-36. Upcoming: Saturday, Oct. 8 vs. No. 36 Virginia Tech (3-1, 1-0 ACC Coastal), TBA. 35. North Dakota State (3-0, 0-0 FCS Missouri Valley) (28/nr/31t) vs. Illinois State (2-2, 0-1 FCS Missouri Valley) Saturday, Oct. 1, 2 p.m. (ESPN3). Last week: Idle. Upcoming: Saturday, Oct. 8 at Missouri State (2-1, 0-0 FCS Missouri Valley), 3 p.m. (ESPN3). 36. Virginia Tech (3-1, 1-0 ACC Coastal) (30/34t/nr) is idle. Last week: Beat East Carolina, 54-17. Upcoming: Saturday, Oct. 8 at No. 34 North Carolina (3-1, 1-0 ACC Coastal), TBA. 37. Western Michigan (4-0, 0-0 MAC West) (37/32/nr) at Central Michigan (3-1, 0-0 MAC West) Saturday, 7 p.m. (CBS Sports Network). Last week: Beat Georgia Southern, 49-31. Upcoming: Saturday, Oct. 8 vs. Northern Illinois (0-4, 0-0 MAC West), 6:30 p.m. (CBS Sports Network). 38. Minnesota (3-0, 0-0 Big Ten West) (nr/38t/31t) at Penn State (Big Ten East) Saturday, 3:30 p.m. (Big Ten Network). Last week: Beat Colorado State, 31-24. Upcoming: Saturday, Oct. 8 vs. No. 29 Iowa (3-1, 1-0 Big Ten West), 12 p.m. (ABC/ESPN2). 39. Memphis (3-0, 0-0 American West) (39/33/nr) at No. 16 Mississippi (2-2, 1-1 SEC West) Saturday, 7 p.m. (ESPN2/SEC Network). Last week: Beat Bowling Green, 77-3. Upcoming: Thursday, Oct. 6 vs. Temple (2-2, 0-0 American East), 8 p.m. (ESPN). 40. Wake Forest (4-0, 1-0 ACC Atlantic) (38/40/nr) at North Carolina State (ACC Atlantic) Saturday, 3:30 p.m. (RSN). Last week: Beat Indiana, 33-28. Upcoming: Saturday, Oct. 8 vs. Syracuse (2-2, 0-1 ACC Atlantic), 7 p.m. (RSN). 41. Toledo (3-0, 0-0 MAC West) (41/42t/nr) at Brigham Young (1-3 Independent) Friday, 10:15 p.m. (ESPN2). Last week: Idle. Upcoming: Saturday, Oct. 8 at Eastern Michigan (3-1, 0-0 MAC West), 3 p.m. (ESPN3). 42. Maryland (3-0, 0-0 Big Ten East) (40/45/nr) vs. Purdue (2-1, 0-0 Big Ten West) Saturday, 3:30 p.m. (Big Ten Network). Last week: Idle. Upcoming: Saturday, Oct. 8 at Penn State (2-2, 0-1 Big Ten East), 12 p.m. (Big Ten Network). 43. Navy (3-0, 2-0 American West) (nr/38t/nr) at No. 45 Air Force (3-0, 1-0 MW Mountain) Saturday, 3:30 p.m. (CBS Sports Network). Last week: Idle. Upcoming: Saturday, Oct. 8 vs. No. 6 Houston (4-0, 1-0 American West), 3 p.m. (CBS Sports Network). 44. Kansas State (2-1, 0-0 Big 12) (nr/41/nr) at No. 28 West Virginia (3-0, 0-0 Big 12) Saturday, 3:30 p.m. (ESPNU). Last week: Beat Missouri State, 35-0. Upcoming: Saturday, Oct. 8 vs. Texas Tech (2-1, 0-0 Big 12), 7 p.m., TBA. 45. Air Force (3-0, 1-0 MW Mountain) (nr/42t/nr) vs. No. 43 Navy (3-0, 2-0 American West) Saturday, 3:30 p.m. (CBS Sports Network). Last week: Beat Utah State, 27-20. Upcoming: Saturday, Oct. 8 at Wyoming (2-2, 0-0 MW Mountain), 3:30 p.m., TBA. 46. Oregon (2-2, 0-1 Pac-12 North) (nr/44/nr) at Washington State (1-2, 0-0 Pac-12 North) Saturday, 9:30 p.m. (Pac-12 Network). Last week: Lost to Colorado, 41-38. Upcoming: Saturday, Oct. 8 vs. No. 10 Washington (4-0, 1-0 Pac-12 North), TBA. 47. South Florida (3-1, 0-0 American East) (nr/46t/nr) at Cincinnati (3-1, 0-1 American East) Saturday, 7 p.m. (ESPNU). Last week: Lost to Florida State, 55-35. Upcoming: Saturday, Oct. 8 vs. East Carolina (2-2, 0-0 American East), 12 p.m. (ESPNews). 48. Appalachian State (2-2, 0-0 Sun Belt) (nr/46t/nr) vs. Georgia State (0-3, 0-0 Sun Belt) Saturday, 12 p.m. (ESPN3). Last week: Beat Akron, 45-38. Upcoming: Wednesday, Oct. 12 at Louisiana Lafayette (2-2, 1-0 Sun Belt), 8 p.m. (ESPN2). 49. Troy (3-1, 1-0 Sun Belt) (nr/46t/nr) at Idaho (2-2, 0-0 Sun Belt) Saturday, 5 p.m. (ESPN3). Last week: Beat New Mexico, 52-6. Upcoming: Saturday, Oct. 15 vs. Georgia State (0-3, 0-0 Sun Belt), TBA. 50. Army (3-1 Independent) (nr/nr/nr) is idle. Last week: Lost to Buffalo, 23-20 (OT). Upcoming: Saturday, Oct. 8 at Duke (2-2, 0-1 ACC Coastal), 3:30 p.m.